Pikes Peak Double – truly a life defining experience. 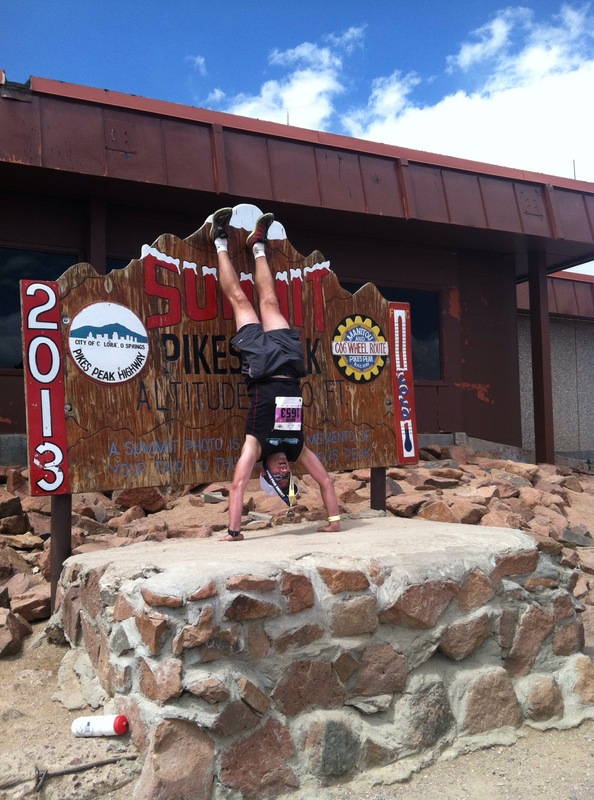 Pikes Peak Ascent – finish cries out for a handstand! It’s been awhile since I shared a post. Maybe that’s not such a bad thing. The culprit is being busy at work and play. So it’s been a summer of fun – I wish I could race every weekend. Not possible due to other events and budget (hence the busy with work). I did enjoy some break-troughs and avoided a near break at Pikes Peak. Enjoyable Havelock 10k with several Freaky Fast teams and a surprise top 3 finish for my team (thanks to a late entry for us who won top overall female!). Nice to break 48 minutes on that course again. Freaky Fast teams dominate Havelock! Lincoln Mile – 1st one since 2000 – snagged a slightly faster time than 11 years ago – 6:16. Still off my PR of 5:59 in 1998, getting so close! 1st sub 23 minute 5k in a long time at the Thunder Run. Finally broke the 5 year average for the Buffalo Run. This race is Lincoln’s oldest – a 5 mile hilly course in Pioneer’s Park. Was battling my 1992-96 self. Set a “mature” Dave PR of 37:03. Not all was record setting this Summer and there were some challenges to navigate. Due to budget and time constraints as well as desire for next triathlon to be a 1/2 Ironman, no triathlon this summer. I was able to volunteer and serve as life guard at the CSG and lend a hand a duathlon. If not racing, may as well help out – plus I learn a good amount by watching the elites (not that I can replicate it. :-)). Took a bit of tumble at this year’s Pikes Peak Ascent – got up, dusted myself off and finished in 4:57. A little ahead of last year, but off my own best and 42 minutes off Wave 1. Due to time constraint haven’t been able to pop into my favorite CrossFit spot – CrossFit Lincoln. I hope to again beginning in November. Also no gym at all since June. With strength a component of my training since October of 2009 this has posed a challenge. The result has been fusing speed, stamina and strength together or what I call S3. From early July to present, I’ve just used what ever I got – dumbbell, body weight, med ball, kettle bell, picnic tables, jungle gyms, park benches, etc – and rolled those into the run, bike, swim workout two to four times a week. The result is a fusion of all three. I’ve researched a bit of the urban or natural workout methods. It’s not ideal but it can work. There’s never an excuse now to exclude strength training. So how did your Summer go? What’s on tap for Fall? Watching my kids enjoy Cross Country, Football and Soccer has been at the top my list. Seeing several cross country meets has brought me back to that grass roots running that hooked my in the early 1980’s – show up, put on a number and run your best. Not much in the way corporate sponsorship or instant electronic results, but a ton of fun! Great race that fills up fast. Join in either the Ascent, Marathon or Both! August 21 – 22, 2010! Chris Crowley in “Younger Next Year” (page 135) shared an important concept in keeping your exercise fires burning – a “kedging”. A kedging is borrowed from old school sailing (not the sport but when sails and ships were the primary transport). The purpose was to get a ship forward when there was a lack of wind or threat of storm. The practice was to send sailors out a 1/2 mile or so in a long boat with a large rope, secure with anchor, return to the mother ship and the whole crew “pulls” with all their might. They do so until they reach the anchor and, if need be, start it all over again. For exercise this is critical to keep and heighten motivation. Each person’s kedging is different – for some their first 5k or 500 yard swim is it. For others it may be a multi day bike ride (100 – 400 miles) or ultra-marathon. The idea is there’s something pressing you beyond what you’ve done before and you’re doing it with a group of other athletes. I thrive when there are a few kedgings each year and have increasingly found myself drawn to events of different types (longer triathlons, open water swimming and nasty marathons). It’s far too easy to slip into a sedentary state without a goal in front of me. The Pikes Peak Double presented the perfect kedging opportunity to test myself. I was blessed to complete the 2005 and 06 Ascents and notched my first PP marathon in 2007. Last year I was turned back before the A-Frame due to ice (grrrr). Feeling frustrated and wanting to hedge my bets, I signed up for the Double: half marathon Ascent on Aug 15 (Saturday) and full marathon on August 16 (Sunday). Net – 40 miles / 14 hours of absolute fun and some pain in 2 days. I’ve scribed some great information from the Pikes Peak website below. Before that are my own reactions and notes I shared with friends a couple of days after (Tuesday, August 17th). Feel good, very good on Ascent. Jogged the first 1.32 with a short, light stride. Walked to Double W then steady jogging to Barr Camp. Walked with some jogging to A-Frame. I crossed into Barr Camp at 2:07 and A Frame at 3:14 – was going for 4:15 if conditions allowed. Scaled back at Cirque (1.25 to go) since hit that at 4:04 so final 1.25 was 39 minutes. I was feeling lively enough to let out a happy shout in one of the photo opportunity just about one mile from the finish. The weather was perfect and no need for additional cold weather gear gathered about me. The Marathon was a whole new experience. The marathon Ascent time was 5:43 or 1 full hour slower. Going down was 3:40. I didn’t feel like the day after a marathon at start, but could tell legs weren’t fully there (calves were very tight). I had a good cold soak and massage on Saturday. Plenty of ibuprofen as well. Sunday morning was a wee bit nervous. Plus my new Garmin froze and left my back up Timex in the hotel. Calves continued to be a little sore going up so walked the entire way up. Split was an hour slower but reinforced you can walk up the entire way – much more traffic though than the 2007 marathon (8:04 then with 4:49 Ascent up). Felt more altitude in terms of swollen hands, lips, etc). Good news going up is that my quads were feeling much better than usual. I had been practicing some of Matt Carpenter’s tips on up/down hill (finding what good hills are available at 1,300′ in Lincoln Nebraska). Going down did a bit more running than in 2007 on the Summit to A-Frame, slowed from A-Frame to Barr Camp and then cranked in much faster (approx based on cell phone) from mile 21 in. Much more confident on foot stride and not hitting anything (leaning in going down and straight posture going up). My last 5 miles were by far my best of the 2 days – was great to apply Matt’s techniques for running the tangent and correct, slightly bent posture going down (versus very straight posture up). Had enough to race the final strong – 7:45 mile and give a nice strange looking finish photo. Definitely felt the adrenaline rush Sunday night – didn’t sleep a whole lot. But made up for it the two nights after. Did some walking on Monday and Tuesday after the Pikes Peak Double – lots of hobbling. I’ll be in Matt Carpenter’s 5 year age group next year.. Ah, he has NO worries from me. He’s very cool and like 07 congratulates each runner as he passes you on his return trip (which was either Barr Camp or the Cog Railway in my case :-)). Whatever your current fitness level, select a “kedging” that truly challenges you – whether your first 5k, group bike tour, ski trip or ultimate freesbie tournament. The adrenaline of the day will pay dividends to you for months! 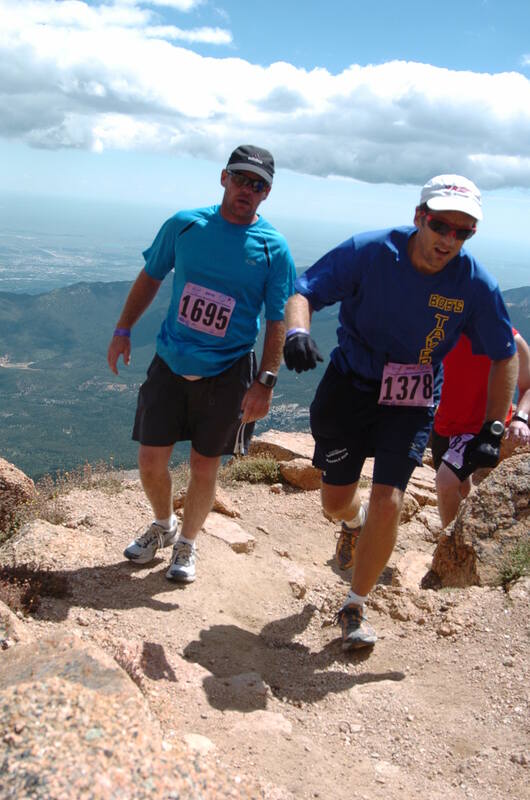 The Pikes Peak Ascent® and Pikes Peak Marathon® will redefine what you call running. Sure, they start out like a lot of races on Any Street, USA. But your first left turn will have you turning in the direction of up! During the next 10 miles, as you gain almost 6,000 vertical feet, your legs, lungs, heart and mind will be worn to a ragged nothingness. But it won’t be until your last three miles, with still over 2,000′ of vertical to go, that you will realize where the Marathon got its moniker—America’s Ultimate Challenge. There’s a reason trees don’t bother growing above 12,000′ on Pikes Peak. They can’t! Makes one wonder if trees are smarter than runners. Above treeline most runners take 30 minutes or more, some much more, just to cover a mile. What little air remains can’t satisfy the endless stream of zombies hoping only to survive their next step—a death march right out of a scene from Dawn of the Dead. Adding insult to injury, it might start to snow! Then, if you are on the deluxe tour, you run back down for the second half of the Marathon. Along the way protruding rocks are waiting to send you crashing to the ground mangling flesh and only temporarily masking the pain of blood filled blisters. Meanwhile, the temperature has often risen by more than 30 degrees since the race start. After all, it’s always best to cook raw meat. 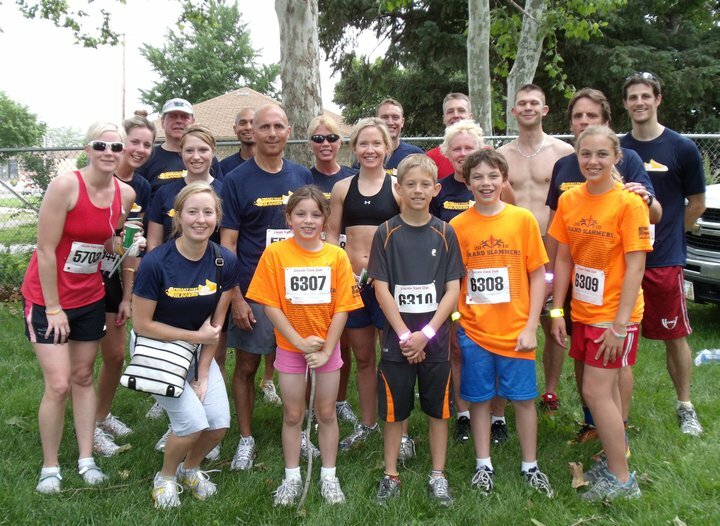 Join us in 2009 for the 54th running of America’s Ultimate Challenge®. growing above 12,000′ on Pikes Peak.